Being a Bride, assigning duties can be a hard thing. Especially if you are a control freak like I am. So to help you out here is a list of the traditional responsibilities of those who participate in the wedding. Hold the bride’s bouquet during the ceremony. Make sure all of the bride’s personal belongings have been accounted for and are packed in her overnight back for the honeymoon. May offer a toast to the bride and groom during the ceremony. Transports groom to the church. Takes care of bride’s ring until ceremony. Offers the first toast to the bride and groom. Prepares the honeymoon car, packs suitcases in car. Holds for safe-keeping, any tickets, keys, etc. for the groom. Returns groom’s tuxedo to rental shop. Seat guests on appropriate side of church. Assist elderly guests to seats. After all guests are seated, unroll aisle runner. There is nothing more delightful or exciting than a butterfly release to accompany your nuptials. These beautiful creatures are majestic yet delicate and command the attention of guests as they are released into creation. 1. Make sure your butterfly breeder is licensed. 2. 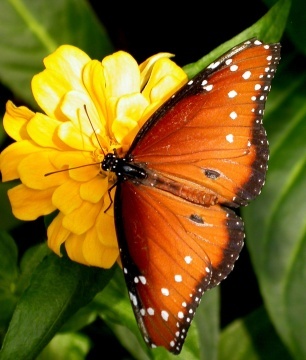 Order your butterflies at least 6 weeks in advance. Remember these butterflies must be hatched, and raised so order early. 3. Make sure the temperature is warm; butterflies enjoy warm weather the most. Anything over 75 degrees Fahrenheit is ideal. 4. Butterflies should be released before dark so check the time of your release. Your butterflies won’t fly if it’s too late in the evening. 6. When you receive your butterflies keep them cool and safe. 7. Assign an “official butterfly keeper” if you won’t be able to watch the butterflies yourself – this is where a wedding planner comes in handy! 8. “Thaw” your butterflies 45 minutes in advance of the release so they will be their most active. If you release them too soon, they won’t be as beautiful, and if you leave them in their packages too long, you have a bunch of dead butterflies. 9. Make sure all of your guests know when to open their butterfly envelopes. This is so they don’t release too soon. 10. Open the envelops and release the butterfly slowly. Allow them to come out and take off on their own. 11. Enjoy the butterflies as they take off into flight. Candles are a classic and traditional gift for a wedding but they do not have to be plain candles. These Autumn Elegance candles are a perfect favor option for a fall themed wedding. 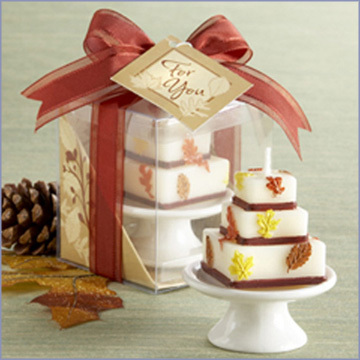 Strewn with autumn leaves, this triple-tiered wedding cake candle comes packaged in its own gift box, tied with a ribbon in the rust-like color of falling leaves. 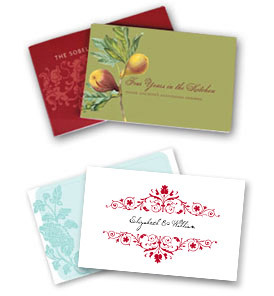 You may also add a personalized gift tags in a color and style that matches your wedding. Check it out! 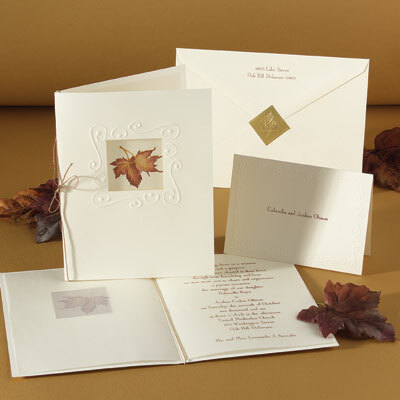 If you are having a fall wedding then this favor would be a festive addition. 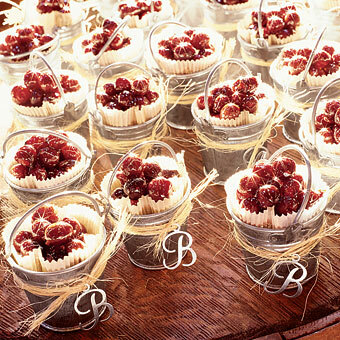 Send the crowd home with caramelized cranberries packed in mini galvanized pails bearing your monogram crafted of tin. This idea would also work for a garden themed wedding. Mini galvanized buckets with monograms. I love this adorable décor idea from the Hostess with the Mostess. Not only are these bridal shower decorations cute they are also something the bride can keep and to add to her kitchen. Don’t you just love decorations that can be repurposed into something useful! These cookbooks are a great idea for wedding gifts. They are perfect for the new bride and groom or for an extra special gift to the wedding party or the mothers of the bride and groom. Secret Ingredients allows you to choose from two styles of cookbooks the heirloom and the keepsake. 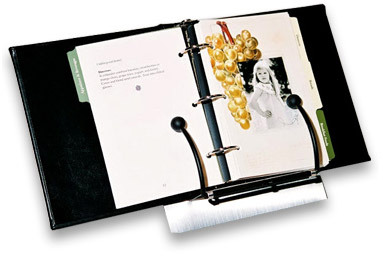 The heirloom contains 250 of your family recipes and can be adorned with up to 15 photographs. The keepsake is a bit smaller and can hold 50 or more recipes. Both cookbooks would be a great gift but I think it would be a very unique and thoughtful present to the bride and groom. This would give the bride and groom a starting point on all the family meals they loved as kids and never knew how to make. This is a great present and I love this idea! I can not tell you how many times I have called my mom asking her for her recipes!Check them out! When choosing flowers for your wedding, one thing you might want to consider is the meanings of these flowers. This gives you a fun way to pick that perfect flower. Attention to detail will make a definite impression among your guests – one not soon to be forgotten. Create an atmosphere of luxury for the ladies. Place vases of fresh flowers, or elegant dried flower arrangements, in the ladies room. Add fragrant bowls of potpourri, heart shaped soaps in decorative dishes, perhaps candles if the venue will permit (votives safely contained in glass holders). 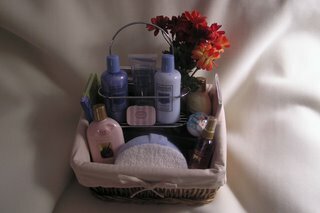 Include a lovely basket filled with items such as hairspray, a container of safety pins, tissues, hair pins, and a decorative dispenser containing hand cream, along with other such convenience items as a courtesy to your guests.